Who Killed the Cayman Ball? The 1970s were a tough decades for visionaries. There were gasoline shortages and people waiting in lines to fill up their tanks and the planet was not making any more oil so that seemed to predict a future where we would all spend big chunks of our lives queued up at the gas station. Instead, by the 1990s tiny gas-sipping cars were being run off the road by mega-ton SUVs that struggled to get gas mileage of ten miles per gallon. Also in the 1970s land prices were going out of sight and the planet was not making any more land so many in the golf industry predicted there would not be enough affordable property in the future to accommodate new courses for new generations of golfers. Instead, the 1990s saw the biggest course-building boom in the sport since the 1920s. A new course opened on average every day. And these modern tracks took up ever-bigger swaths of land until some layouts stretched over 8,000 yards from the tips. One of those golfing soothsayers back then was none other than Jack Nicklaus who designed a course in the Cayman Islands that he believed would be a prototype for the future. It was compact, environmentally-friendly, required minimal maintenance and chewed up far less land and money to build than a standard course. Nicklaus even had his equipment company, MacGregor, design a special golf ball to play the Tom Thumb course. Instead of dimples the Cayman Ball had a brambled surface. On a full swing the ball would travel about half as far as a USGA legal ball and react similarly in flight. As swings got shorter the ball would react more closely to a regulation ball and even chip and putt almost the same. There seemed to be a lot of positives lined up in the Cayman ball philosophy column. Eagle Landing Golf Club in South Carolina opened as the first Modified Golf Ball course in the United States. But the Cayman crusade never took flight. Maybe Americans just like to drive big cars and hit golf balls as far as possible. Cayman balls can still be found online today and are popular for teaching in schoolyards and urban areas. The hard thermo-polymer plastic balls are great for backyard practice. 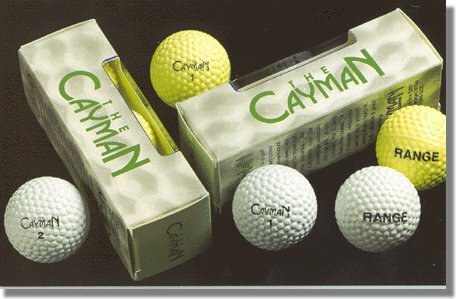 You can even take them down to the forward tees and play a round with Cayman balls. Maybe their time in American golf is still to come.